Limbuwan means "abode of the Limbus" or "Land of the Limbus". Limbus themselves call Limbuwan "Yakthung Laaje" or "the country of the Yakthungs". "Yakthung" word means "Limbu" in the Limbu Language. 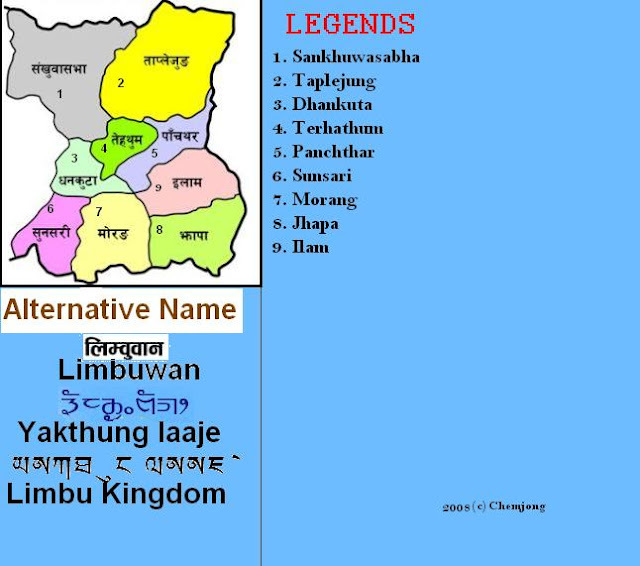 The Ten Kings of Limbus came together to formally declare all the ten kingdoms between the Arun River and Teesta River to be called “Yakthung Laaje” or “Limbu Kingdom”. Today, Limbuwan comprises the districts of Taplejung, Panchthar, Ilam, Jhapa, Terhathum, Sankhuwasabha, Dhankuta, Sunsari and Morang. Limbuwan is the land east of the Arun and Koshi Rivers and west of Kanchenjunga Mountain and the Mechi River. Samlupi Samba Hang, King of Tambar and his capital Tambar Yiok. Sisiyen Shering Hang, King of Mewa and Maiwa kingdoms and his capital Meringden Yiok. Thoktokso Angbo Hang, King of Athraya and his capital Pomajong. Thindolung Khokya Hang, King of Yangwarok and his capital Hastapojong Yiok. Yengaso Papo Hang, King of Panthar and his capital at Yashok and Pheden (Phe meaning “plain”, den meaning “place”). Shengsengum Phedap Hang, King of Phedap and his capital at Poklabung. Mung Tai Chi Emay Hang, King of Ilam and his capital at Phakphok. Soiyak Lado Hang, King of Bodhey (Choubise) and his capital at Shanguri Yiok. Tappeso Perung Hang, King of Thala and his capital at Thala Yiok. Taklung Khewa Hang, King of Chethar and his capital at Chamling Chimling Yiok. After a brief period, King Mawrong Hang came to prominence and took over Terai lands of Chethar, Bodhey, Panthar and Ilam (present day Jhapa, Morang Sunsari and Dhankuta). He named his Kingdom Morang after his name and rose to power. He subdued all the Ten Limbu Kings of Limbuwan and became their overlord. He died without any male heir and King Uba Hang took over as supreme ruler of Limbuwan in 849 AD- 865 AD. He made many religious and social reforms in Limbuwan. Uba Hang’s worthy son Mabo Hang succeeded him in 865 AD and ruled till 880 AD. Uba hang kept on with the reforms his father had started. Uba Hang was succeeded by his son Muda Hang. Muda Hang was a weak ruler so the local chiefs started ruling their areas independently. Muda Hang was succeeded by his son Wedo Hang, by this time Limbuwan was in chaos and every principality was ruling independently and fighting with each other. Wedo hang was murdered and his son Chemjonghang succeeded. 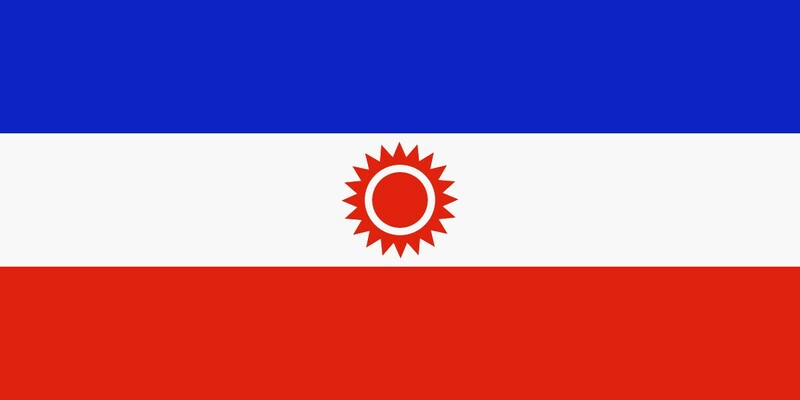 During this chaos and the waning phase of King Chemjong hang, King Sirijonga of Yangwarok kingdom rose to power. He subdued all the independent rulers and took over as the new supreme ruler of Limbuwan. He built two big forts in Phedap (present day Terhathum district) and Chainpur (present day Sankhuwasabha district). The remains of the structure still stand today. One of legacy was that he brought all the Limbus under the same writing system in Limbu script. He also brought feudal reform in Limbuwan and divided Limbuwan into new boundaries and districts. In the beginning of the 15th century, the descendants of King Sirijonga became weak and Limbuwan again fell into chaos and anarchy. At the time Lowland Limbuwan Kingdom of Morang was ruled by King Sangla Ing. Sangla Ing declared independence and became the first independent ruler of Morang in a century. His son Pungla Ing adopted Hinduism and changed his name into Aamar Raya Ing. He was succeeded by his descendents, who also bore Hindu names. Kirti Narayan Raya Ing, Aap Narayan Raya Ing, Jarai Narayan Raya Ing, Ding Narayan Raya Ing, and Bijay Narayan Raya Ing. King of Phedap Murray Hang was made the chief minister of Morong. He stayed in Bijaypur and the King of Morong made his post hereditary. Murray Hang was given a Hindu name and he became Bidya Chandra Raya . His descendents remained Chief Ministers of Morong until Buddhi Karna Raya Khebang . Buddhi Karna succeeded the last Sen King of Morang Kama Datta sen and sat in the throne of Bijaypur Palace in 1769 AD. Meanwhile, the Gorkha King Prithivi Narayan Shah was on a campaign to conquer all the hill kingdoms into his Empire. He attacked Limbuwan in two fronts. After the Limbuwan Gorkha War 1771-1774 AD, the Limbu ministers of Morong, and Limbu rulers of the ten principalities came to an agreement with the King of Gorkha. 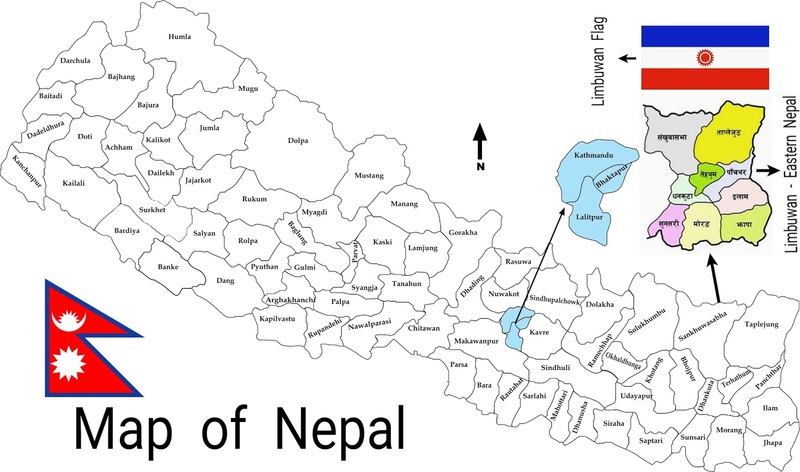 With the Limbuwan Gorkha treaty of 1774, Limbuwan was annexed to Nepal. Limbuwan was attacked several times by Sikkim after 1774 AD. Battle of Morong during the British Gurkha war took place in Morong. 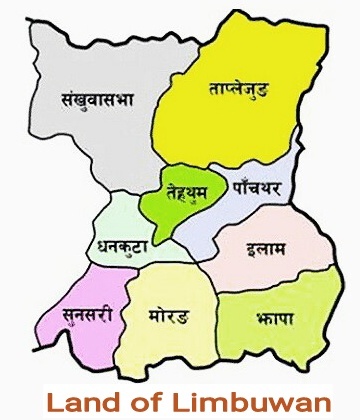 Limbuwan was divided into present day administrative districts in Panchayat era by King Mahendra. Taplejung, Therathum, Ilam, Panthar and Morang was named after their original names, whereas names of the other districts in Limbuwan were Hinduised.